Report on healthcare in Pennsylvania: In November, Put People First! PA and NESRI published a new report, Beyond Coverage: Putting People First in Pennsylvania’s Healthcare System. The report draws combines data from over 300 surveys with Pennsylvania residents’ stories and human rights framing to reveal how the state’s healthcare system is failing people today and to share a vision for winning a healthcare system that meets everyone’s needs. Analysis of the coming Republican attacks on healthcare: Read NESRI’s analysis of what to expect for the Affordable Care Act, Medicaid, Medicare and the rest of the healthcare system. Fresh analysis on our new Media page: For the latest writing from our members, media coverage, and our videos and other media, check out our new Media page on our website. New pieces include op-eds on the insurance rate increases from Val Kater of PPF-PA and Ben Palmquist of NESRI as well as Ben’s commentary on price gouging and profiteering by medical giants Mylan and Aetna. Talking points on insurance rate hikes: Though the long-term future of the ACA marketplaces is uncertain, in the short term, millions of people will see their premiums increase dramatically on January 1. Read Put People First! PA’s and NESRI’s talking points on how for-profit insurance is driving the market turmoil and the 22% average nationwide insurance rate increase. A Vision for Black Lives: Policy Demands for Black Power, Freedom & Justice: If you haven’t seen it yet, be sure to look at The Movement for Black Lives’ powerful vision and policy platform for realizing human rights and collective liberation by centering the needs of Black communities. The Invest-Divest section of the platform includes a set of of policy demands for “real, meaningful, and equitable universal health care.” NESRI separately contributed to policy demands on land use, tax policy, budgets and trade. Resources on the coming attack on healthcare: The Consumers Union has posted a collection of analyses from the Kaiser Family Foundation, Commonwealth Fund, Center for American Progress, and other pro-ACA think tanks on what repeal and other Republican proposals could mean. Standing Rock study guide: Want to know more about the struggle at Standing Rock? The Kairos Center put together a helpful report and study guide. Following the election of Donald Trump and the change of power in the Senate, Republican leaders are in position to push forward with a sweeping overhaul of the healthcare system. Though they have not yet publicly announced the specific policies they will push, it is clear that the party leadership will pursue an extreme ideological agenda that will have the effect of limiting people’s access to healthcare, driving up healthcare costs for millions, increasing income inequality and financial insecurity, deepening false racial divisions to enormous effect and expanding corporate profits and power over people’s lives. Though the plans differ on some policy specifics, there is clear alignment on sweeping privatization and draconian cuts of our public health programs—Medicare, Medicaid, ACA subsidies, and veteran and military healthcare plans—that would force higher healthcare costs on the elderly, the poor, and people with serious medical conditions. Let us be clear: by revoking people’s access to care, these extremist cuts and privatization will kill tens of thousands of people every year. As people who are directly impacted by healthcare, racial, economic, and gender injustices, we, the members of the Healthcare Is a Human Right Collaborative, stand committed not just to defending against these attacks on our health, but to bringing the diverse communities that are most excluded from the healthcare system into the center of healthcare policy and the healthcare justice movement. This is both a moral imperative and a strategic one. Racism and xenophobia were central to Donald Trump’s campaign, and using race to pit poor and working class communities against each other has always been central to the strategy to beat back social protections and just, equitable economic policies in the United States. By conjuring the perception that an undeserving group of “others” (most often an implicit reference to Black and Brown people) will benefit from any government program at someone else’s expense, extremists and healthcare profiteers have created an imagined sense of scarcity and stoked divisions, mistrust, and false competition. This is an intentional political effort to open up room for profiteering by the insurance, pharmaceutical, and hospital industries by masking the fact that a universal, publicly financed system of healthcare would help everyone who struggles to afford care in the privatized insurance system, including communities of color and white communities alike. Refuse to compromise on people’s health and dignity by fighting tirelessly for a healthcare system that puts human rights and human health ahead of private profits and ideology. Always support the leadership of people who are most impacted by healthcare injustices and by intersecting racial, economic, gender, ableist, and other injustices. Support people through the coming attacks on healthcare and communities, including Muslims, immigrants, and all poor and working class communities. Deepen and broaden our alliances and strategic partnerships with our fellow organizations in the struggle for human rights and dignity. 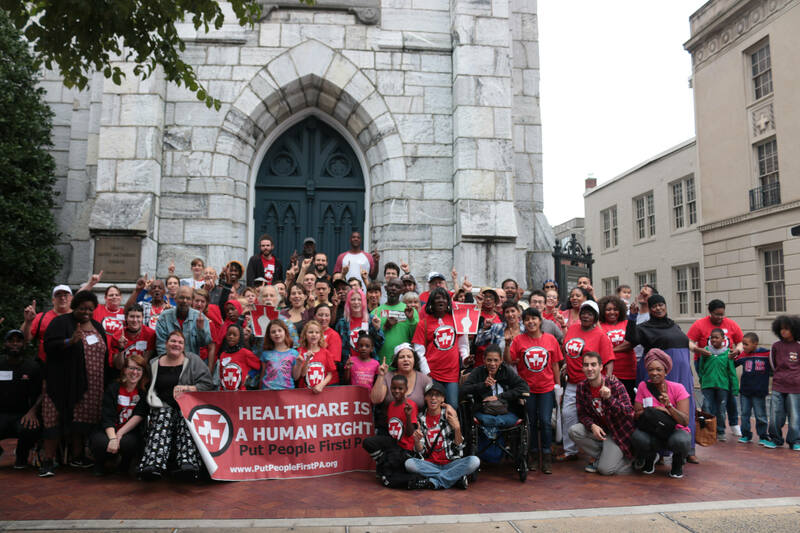 Back in July, the Healthcare Is a Human Right Collaborative held our annual convening in Portland, Maine, where we were hosted by the members of the Southern Maine Workers’ Center. Dozens of us came together to build relationships and learn from each other across states, and we were pleased to be joined by allies from Healthcare NOW! and SPAN Ohio. We explored three major areas of our campaign work together: charting out medium-term campaign goals on the road toward our long-term goal of winning universal, publicly financed healthcare; developing better organizational structures to facilitate democratic leadership, transparency, accountability and communication across our statewide organizations; and developing leadership across lines of difference such as race, age, gender, and urban and rural areas. As the new year approaches, we are looking forward to joining many of our allies from across the country at the Single Payer Strategy Conference in January, where we will lead a workshop on coalition building between unions, single payer groups, and base-building organizations like ours. Please join us! The last six months have been busy ones for Put People First! PA. 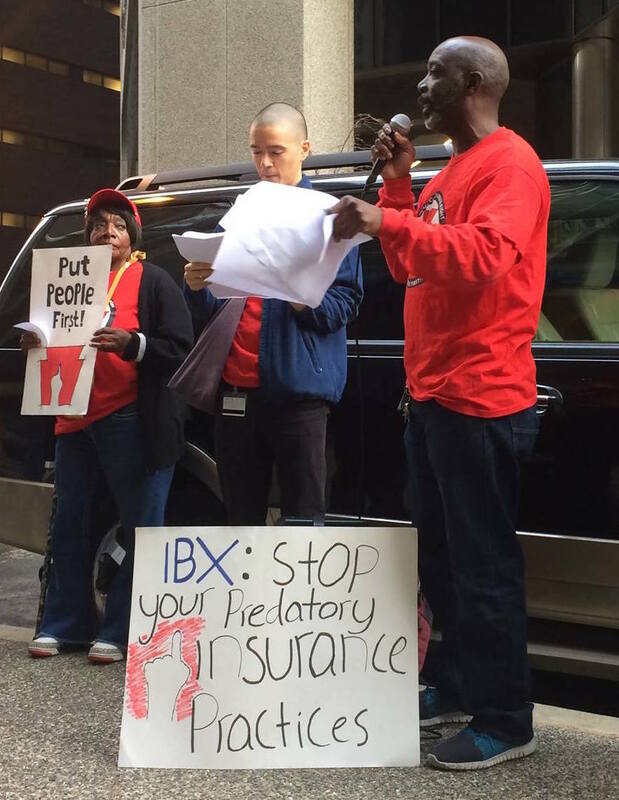 In July, members celebrated a big victory by winning a nine-month campaign to pressure the Pennsylvania Insurance Department (PID) to host a public hearing on insurance rate increases for 2017. Over two dozen P PF-PA members turned out to the hearing to testify, sharing heart-rending stories about being denied care, facing treatment delays, and being hit with thousands of dollars in bills they cannot afford. The hearing was a show of PPF-PA’s power, but the state’s healthcare system remains far more responsive to insurance companies than to the people of the state. In October the PID announced it was permitting insurance companies to raise people’s insurance rates on individual plans by a stunning average of 32.5%, significantly more than what insurers requested. PPF-PA members led three big actions in recent months against insurance giant Independence Blue Cross (IBX): a demonstration during the Democratic National Convention, a Halloween #TrickNotTreat action in collaboration with Students for a National Health Program (SNaHP), and a November protest against the insurance rate hikes. PPF’s members have also been organizing locally across the state. Over 80 members came together in Harrisburg in October for their annual Membership Assembly, the York Organizing Committee hosted a community healthcare forum, the new Southwest PA Organizing Committee in Pittsburgh hosted a human rights town hall meeting on healthcare, and the Base Building, Media & Communications and Campaign Teams all held strategy retreats. Amidst this all, PPF-PA has welcomed Carla Christopher and Ben Fiorillo on as part-time organizers in Central and Southwestern PA, and has said goodbye to Southeast PA organizer Sheila Quintana. PPF-PA is currently hiring a new Southeast PA organizer. 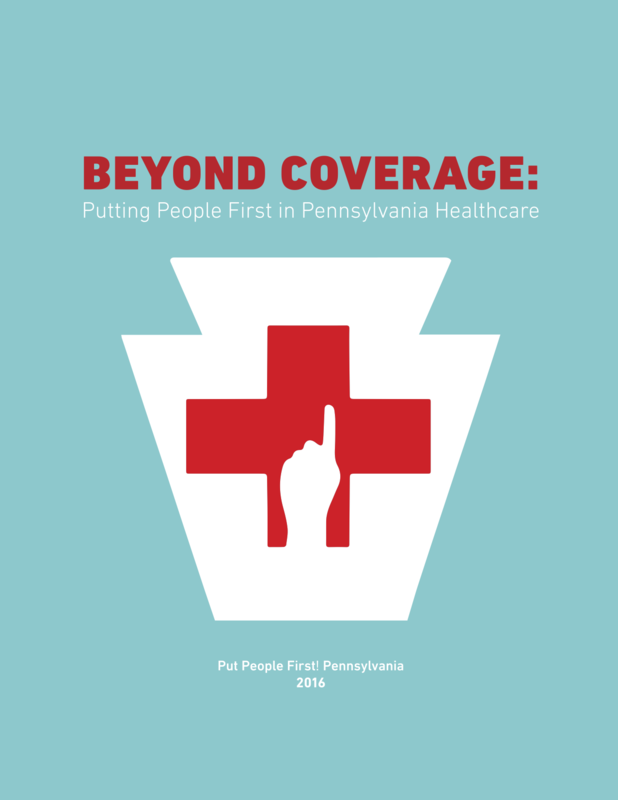 To find out more, be sure to check out PPF-PA’s recent biannual newsletter, published members of the Media & Communications Team, and PPF-PA’s and NESRI’s new report, Beyond Coverage: Putting People First in Pennsylvania’s Healthcare System. The Southern Maine Workers’ Center (SMWC) has been hosted a string of events in recent months. In August as part of our HCHR Collaborative convening, SMWC hosted a public event, More than Just Health Care: Stories About Building a National Movement for Human Rights, featuring leaders from SMWC, PPF-PA, VWC, and NESRI who shared personal stories about why human rights organizing has transformed their lives. In the fall, members of SMWC’s new Lewiston Chapter came together for both a member lunch and an orientation. And following the election, SMWC’s Work with Dignity campaign meeting drew an incredible 95 people! Behind the scenes, the campaign has been busy. Ronald Flannery joined SMWC as the HCHR organizer over the summer, and is working with members to reach out to people in the areas of Southern Maine that have been hardest hit by austerity. SMWC has been deepening ties and developing plans with the Maine State Nurses Association and Maine AllCare through the Maine Health Care Is a Human Right Coalition. Members, with support from NESRI, are analyzing data from over 1,300 healthcare surveys and beginning to outline an upcoming report. And earlier this month 25 leaders and board members came together for SMWC’s annual leadership retreat to evaluate, strategize and dream. 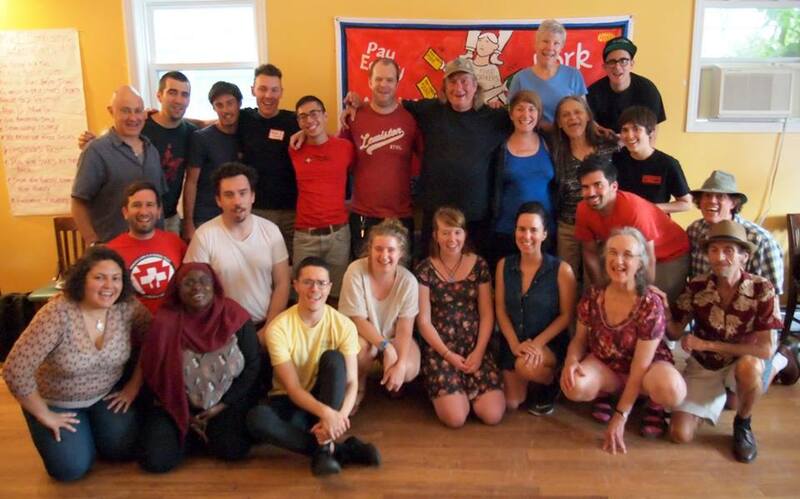 The Vermont Workers’ Center is reinvigorating member leadership on multiple fronts. In November, dozens of members came together in Barre from all corners of the state for the Workers’ Center’s annual membership assembly. At the assembly, members voted to charter county-wide chapters and to create a new team of member-coordinators to hold key pieces of work. Members have also developed a new healthcare organizing tool asking people about their hopes and fears around healthcare, and have been using the tool in canvassing in Windham, Windsor, and Chittenden counties. A team of people is also are gearing up to host healthcare screening clinics in the new year. The HCHR campaign has also been working in support of nursing assistants, unit secretaries, and mental health technicians at the University of Vermont Medical Center, Vermont’s largest hospital. These healthcare workers play a vital role in the healthcare system, but are understaffed, overworked and underpaid. The workers are in the process of forming a union, and are seeking to get the hospital to enter into collective bargaining with them. VWC has been organizing solidarity support for the workers, including turning out members to a hospital board meeting earlier this month. Our friends at Healthcare-NOW, the Labor Campaign for Single Payer Healthcare, National Nurses United and Progressive Democrats of America are organizing this conference January 13th-15th in New York City, and we’ll be there to meet people and to lead a workshop on building strategic partnerships between single payer groups, unions, and base-building organizations like ours. NESRI and PPF-PA attended a post-election strategy meeting in Washington, DC, hosted by the organizers of the Single Payer Strategy Conference and the AFL-CIO. The organizations that attended the meeting are forming a new coalition, the Campaign for Guaranteed Healthcare, to push proactively for universal, publicly financed, Medicare-for-All healthcare. Colorado voted down a constitutional amendment that would have created a universal, publicly financed healthcare system in Colorado. A startling 79% of voters voted against the ballot measure. Healthcare justice organizers around the country are drawing many lessons from the defeat. As the bill’s backers point out, an estimated $10 million of industry and Koch brothers money was funneled into Colorado to defeat the proposition (mirroring the $100 million spent by drug companies to defeat a California proposition that would have limited drug prices). Others have pointed out that the campaign initially adopted problematic anti-government rhetoric that adopted the language of its opponents rather than advancing a positive vision for a just, democratic society; the legislation called for an inequitable flat tax that made the campaign vulnerable to the prevailing anti-tax rhetoric; some unions and women’s organizations opposed the bill because they were not brought to the table as partners early on in the coalition-building and legislative drafting process; and the campaign put its faith in a broad but shallow paid-canvasser strategy that succeeded in winning tens of thousands of signatures and hundreds of thousands of votes but was ultimately unable to organizing a mass base of people and a coalition that were deep, broad and committed enough to overcome such a hugely powerful opposition.